Well, this guy has beaten the rest of us to the scoop. A small number of researchers including Geoff Sharp, Gerry Pease, Ian Wilson, Ray Tomes, Ulric Lyons, Gray Stevens, Milivoje Vukevic, Paul Vaughan and myself have been working away on the motion of the planets with respect to the solar system barycentre and various interesting orbital periodicities and resonances. 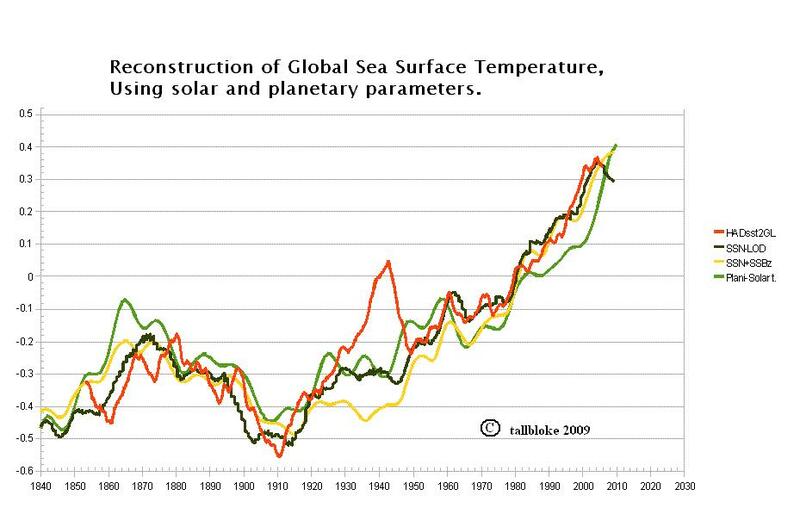 We’ve all found remarkable correlations between various phenomena which hint at a planetary effect on the suns behaviour. Now Petr Semi Semerad has pulled a lot of things together and discovered the key to the holy grail: the resonances matching the sunspot cycle. But more than that, he has filled the cup to overflowing with a rare vintage of observations which will be keeping us all busy for a long time to come. – Pink background serie – Tidal angle between Mercury and Jupiter at times of Earth-Venus oppositions. – Outer blue serie – with connected maximums to show its envelope (see also fig. 89) – Tidal angle between Earth-Venus barycenter and Jupiter, with added or subtracted (with less importance) the Tidal angle between Jupiter and Mercury. – Bold blue dots at X axis – historical record of “severe winters” in central Europe. 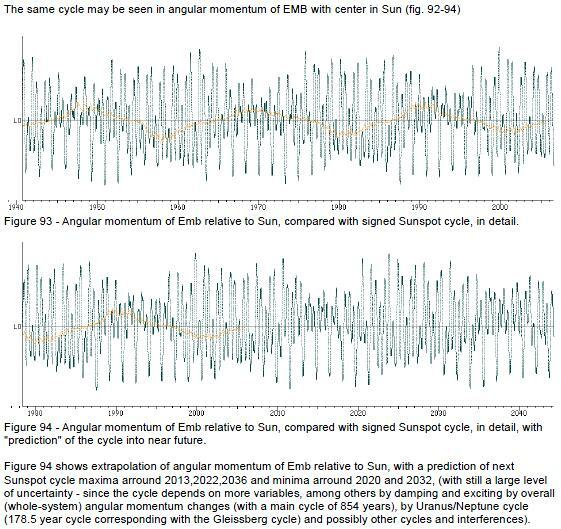 This graph shows the relationship between the motion of the planets, the length of Earth’s day, and the changes in global temperature. 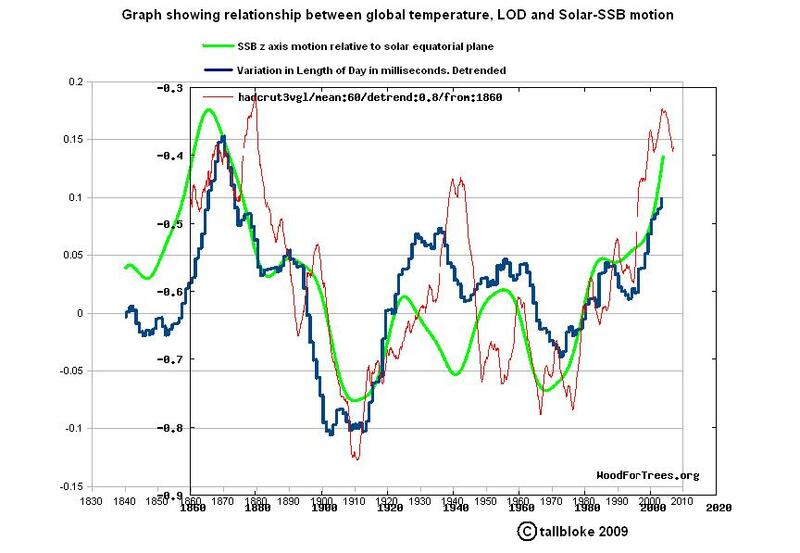 Graph of the SSB-solar equatorial distance in the z axis against changes in length of day and global temperature. 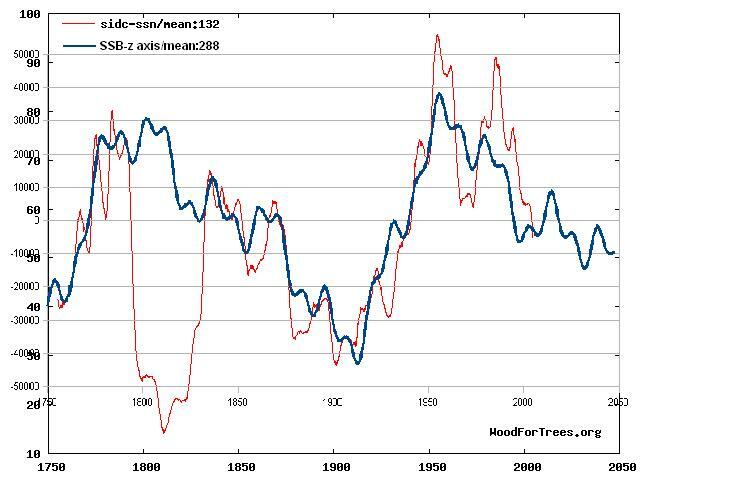 The Red curve shows HADcruV3 global temperature. I’ve detrended this to something more reasonable than the treasonable nonsense Phil Jones has left us with. The Green Curve is the distance between the solar system’s centre of mass and the solar equatorial plane in the vertical ‘z’ axis. This distance is determined by the changing disposition of the planets in the solar system over time. 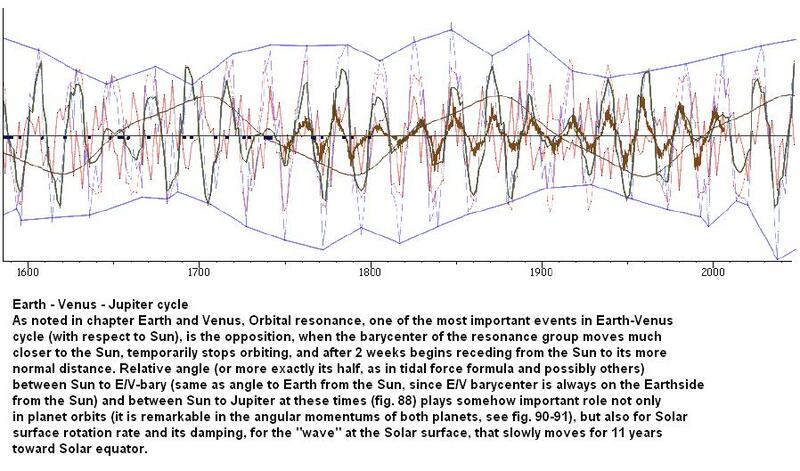 Extra info added: The data is smoothed over 24 years (Two Jupiter orbits) and retarded 30 years. This is indicative of the inertia involved in the LOD variation lagging behind the combined effect of the gas giants motion. The Blue curve shows changes in the Earth’s length of day in milliseconds. This has been detrended. This has been done to separate the effect of planetary motion from longer term cylicities which may affect LOD. What underlying physical principles connect these three phenomena? Gravity? Magnetism? Resonant feedback between celestial bodies? Answers on a postcard, or just post below with your thoughts.